There’s a thing about Kochi that gives it a different feel from any other city I’ve been to in India. It has something to do with the way its parts are spread across several islands; compartmentalized bits of Indian culture. On the mainland lies Ernakulam, which exudes some of the metropolitan vibe of the HiTec cities of the south, such as Bangalore and Hyderabad. It’s loud, dusty, hectic, with pollution-belching traffic clogging the streets and alleys. Air-conditioned malls, many dedicated to the wedding stalwarts of silk sarees and gold jewellery, line central MG Road; new constructions arise from barren lots in the side streets and there’s not a pedestrian crossing in sight. Then comes Willington Island, a long, narrow strip of land half a kilometer out to sea. It houses a part of India that is central to most coastal cities, but which is usually hidden from view: the commerical port, stockyards and warehouses, and a large naval base. 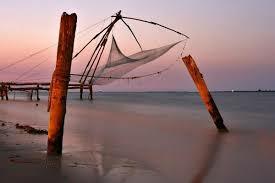 Another 500 meters across the waters lies Fort Cochin, officially part of the mainland, but with a distinct island feel. It’s the old colonial city. Narrow streets with stone buildings on either side, 16th century Portuguese churches, a Dutch cemetery, remains of the old fort, cannon in place, and plenty of facilities for the modern independent tourist: homestays, outdoor restaurants and the occasional internet cafe to complete the picture. Along the northern coast gargantuan Chinese fishing nets are plunged into the water by four men crews, and at an informal fish market the daily catch is traded as fishermen motor their small crafts onto the beach. In the background, ferries ply between the half dozen main islands. In Kochi you get to experience India in bits and pieces. It is like a thali with Ernakulam, the Fort and industrial areas served in small portions to be enjoyed one by one. Never too overwhelming, but containing everything you’d want. Our life on this here earth is ever so brief and transient, but once in a while mankind succeeds in creating something that stands the test of time, that is made for all eternity so to speak. To some these works – the Gizeh pyramids, the Great Wall, Domino D-Day – are testament to the greatness of man, to others they bear witness to his follies. The final judgment is often in the eye of the beholder. Once in a while, though, we can all agree on something. Take the Ooty Thread Garden for instance. A certain Anthony Joseph, playing around with some ideas in his workshop, came up with a novel way of creating fake flowers by winding coloured threads around pieces of canvas. A nice hobby, one might say, quite artistic in its own right even and something that could be a nice addition to any country fair. If only he would have left it at the workshop. But no. Anthony had bigger plans. He dreamt of greatness, threaded greatness that is. 12 years, 50 female volunteers and 60 million meters of thread later the garden was a fact. It is housed next to the Ooty lake and boat house in a ramshackle structure with disused advertising signs for a roof. Entry is gained through a small corridor, after which the threaded spectacle unfolds in all its splendor. It’s quite the feat. Honestly, very beautifully done. But it’s hard to get over the astounding pointlessness of it all. Such an incredible amount of work to create fake flowers. The question begs. Why? I’m still writing about this, so fair point. Alright. We’re getting somewhere. But there’s more, no? And there you go. The Hindu Business Line reports that Anthony Jacobs is planning similar labours of love overseas, so soon you too may bear witness to the greatness of man. After spending a couple of days catching up with friends in Hyderabad, I took the night train to Hampi, the old capital of the Vijayanagar kingdom. Once a city grand enough to invite comparisons to Rome by a 16th century Portuguese traveler, these days it consists of a small dusty village, surrounded by miles of abandoned ruins. Hampi is an interesting place to visit. It grows on you. The first day, still groggy from the overnight journey, I wandered about the village streets. The sights were familiar: children walking by full of smiles, saying hi, sometimes asking for a pen; souvenir salesmen and ayurvedic masseurs trying to lure you into their shops; and all around the boulder strewn landscape covered in the remains of the once great temples. After visiting the three or four most important ones – the ones recommended by the guidebooks and consequently the ones where the tour buses gather-, I’m tired as evening falls and feel a little ruined out. How much more can one really see and appreciate? On the second day, though, I venture out further afield and all of a sudden I’m on my own. Vast temple complexes with monkeys clambering across crumbling gopurams, even vaster market places stretching out hundreds of meters into the green grass, and there’s only myself and the occasional caretaker. That’s the thing about Hampi. You can roam around for days discovering new places never mentioned in any guidebook and only appearing as a few dots on a local map. The ruins line all the hillsides and valleys down to the smooth flowing river that continues to provide a lifeline to local population. They navigate the currents in what appear to be upturned two-meter wide round baskets. There are signs warning of wily crocodiles, represented in full technicolor, and deadly whirlpools, but undeterred I take a trip upriver after the boatsman rubbishes the warnings. Even here the ruins are visible. We pass temples and hermits’ caves, which disappear each year under the roaring monsoon tides. At one stage we’re caught out by a sudden downpour, but the boat turns out the be multi-functional as we go ashore and flip it over to create a makeshift shelter. On my last day I cycle downstream along the river passing the remains of what once was a 400 meter bridge connecting the embankments. I’m trying to get to Anegundi on the left bank, but when I get to the site of the new bridge, which was due to open only this year, I find its two middle sections collapsed in the river. The scene is quiet. A few men amble around a foursome of concrete-pouring trucks, but evidently work has stopped since the accident. On the opposite bank a massive slab of concrete slants at a 45 degree angle into the water. An old lady uses the convenient surface for washing clothes, slapping the cloth harshly against the road surface before rinsing it out in the passing current. As I park my bicycle in front of the archaeological museum, a man sitting in the shade of the empty ticket office takes four Rs. off me and gestures me inside. A few meters in, a security guard stops me. Where’s my ticket? I try to explain I didn’t get one and go out again, but the man is gone. I buy a ticket, an actual one, from the lady who’s suddenly appeared in the office. That’s India for you. They Paved Paradise and put up a Parking Lot OR Paradise Lost. Pick your favorite cliche and apply it most appropriately to Ko Phi Phi. We knew something was amiss when the minibus pulled into the ferry carpark, dropping off the nine of us. Dozens of similar minivans and some fifteen large touring buses were busy disgorging pockets of stunned-looking tourists. Several uniformed attendants armed with piercing whistles shepherded the crowd unto a trio of waiting boats. We were distributed according to the color of the stickers we’d been given and off we went. A swell was running in from the south-west, which made the ship lurch to and fro quite uncomfortably and soon plastic sick bags were being handed around. I don’t get scared too easily on the water, but the seemingly uncontrollable rolling, which sent the unsecured luggage flying around the bottom deck, combined with a total lack of safety measures – we counted eight life vests for 300 hundred odd people on board, which were mysteriously being dumped down the stairwell, perhaps to cushion the suitcases – put the fright in me. Oh yeah, and one of these sank a few years ago. After an hour and a half of sweaty palms, only enlivened by the highly entertaining auto translated subtitles to the onboard movie, ‘Very abundantly please”, Ko Phi Phi Leh, the group’s smallest island, came into view. An astoundingly beautiful sight. Sheer limestone cliffs rising vertically from an azure sea, covered in lush green tropical forest, and at the bottom, appearing as if a mirage, the most perfect crescent of clear white sand. Maya Bay. And then you get closer. And you realise that this is the beach, that beach, from the eponymous movie. How do you know? Well, those twenty odd boats and two hundred people on that beach kinda give it away. We admired the view for a few minutes and the boat pulled away and rounded the island, passing secluded inlets and caves carved out by the slow-pounding surf. Everywhere it was the same. A fleet of speed and longboats ferrying brown-baked foreigners and locals alike to experience the marvelous beauty in a crowd usually reserved for football stadiums. From Leh we made our way over to Don, the big island, which gave much the same picture. What once must have been the most perfect ishtmus of sparkling sand connecting forming two placid bays, now lay chock-a-block with hotels, souvenir shops and other concrete outcrops, hardly a speck of sand left untouched. Tourism here is trying to imagine what the tourists before you saw. Those first ones to whom the island was a deserted tropical paradise, uninhabited only twenty years ago. 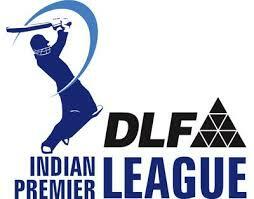 IPL hits town… The end of Cricket as we know it? Living in India for almost a year now, I’ve gotten used to cricket. How could I not? It’s positively everywhere. There’s cricket on TV all day, every day. There are matches in vast arenas and impromptu affairs on the streets and fields in every part of the country. I saw kids playing games in the deserts of Rajasthan and on the banks of the holy river Ganges. I even saw a group of boys in the Himalayan town of Gangtok wack the ball around and that’s dedication for you with streets steep enough to make San Francisco’s look tame. But in spite of all the cricket there was something missing. You got it. More cricket! The teams have funky sounding American names. ‘Chennai Super Kings’ or ‘Kolkata Knight Riders’. The latter are symbolised by flaming leg-guards and helmets in a faux-medieaval style. It’s cute. Player interviews take place during the game with the help of wireless microphones. It’s quite ingenious, they’ll be asking a fielder one of those inane sporting questions like – How are the conditions out there? – when suddenly a ball whips by and the poor guy tries to chase it down the field. Gee, I wonder why he missed the catch ! To be fair the games are pretty enjoyable. It’s Twenty20 after all, the high-scoring, shortest version of the game and it wraps up in a mere 3 hours. The real killer though is in the broadcasting. I’ve seen quite a bit of commercials in my day – American Idol, anyone? – but the IPL tops it all. I did a quick count. In 5 minutes of watching I saw 3 full length tv ads, 2 half-screen ads that push the actual game aside and come with music and sound effects, and 2 roll-over banners that unfold across the center of the sceen anytime someone hits a big score; they make noise too. On top of that there’s a little 3-d cube ad that flips around every minute or so. In all about 10 ads per 5 minutes, meaning 120 ads per hour or 360 for a full match. And I’m not counting the on-field advertising of course. Overkill? You might say so. I’ve resorted to switching the sound off for the entire game. I couldn’t be bothered flipping channels anymore and the sound really is the most annoying. I mean after hearing those two brats fighting about the best flavor for their fruit juice (Apple or Orange ??) a few hundred times, you really have to draw the line. By the way, has no one in this league heard of frequency capping? Anyways, I should wrap this up. There’s a match on. 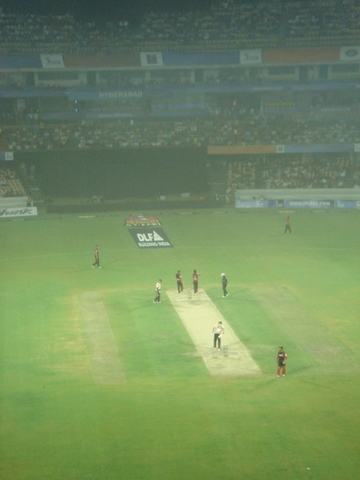 Delhi Daredevils (no sniggering please) vs the Bangalore Royal Challengers. I’m a Deccan Chargers man myself, only managed to win one game so far. Maybe I should buy a shirt before I leave India, hmm. It’s been a while since I last posted. Not because there wasn’t anything going on in my life. (I’ve traveled to the north-eastern states recently, so expect some posts on that briefly.) No, my blogging silence is due a new website I’ve been working on. I spent every waking, post-work, internet hour, polishing up the online presence for a little house I bought in France a few months back and I’m happy to say that it’s up and running.